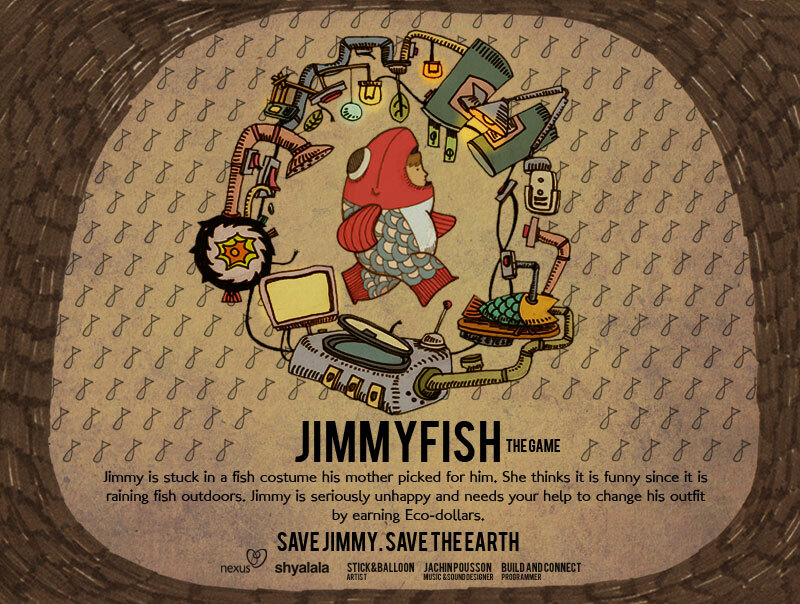 yanyun chen: JimmyFish The Game! Over January and February, I was working two shifts. In the day, I was hacking away at materials to create the sets for "The Gruffalo's Child" at Studio Soi; while at night, I was scratching away on paper to create the characters, design and game play for my first epic flash game. My boy spent most of his evenings supporting me quietly while my busyness happen, I feel bad for having neglected him! Thank you for being there dear one. The environment has been pretty horrible recently and it's been raining fish outside. Jimmy is going for a party, and he regrets letting his mum buy him his costume - a fish. His mom thought it might be funny and thought its appropriate considering the weather around them. 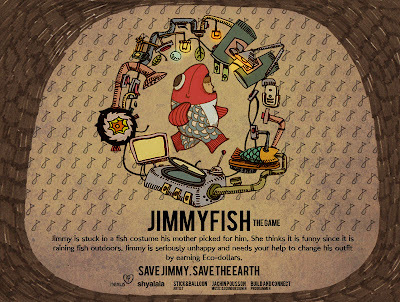 Now, the only way Jimmy can get out of the costume is to find as many ways he can to save energy and resources in his house, and for each new way he finds, he earns one eco dollar. The more eco dollars he saves, a better costume he can get. And he saves the environment too! The game is a collaboration with Build and Connect, Jachin Pousson, Nexus Singapore and created, designed and animated by our good old Stick and Balloon. We really hope you enjoy it! One can find the game here!